N3887E - 7AC Champ at Westfield (I72) | Indiana Pilots Club, Inc.
$28,000 maximum member damage liability. Minimum 15 hours tailwheel time. Initial checkout 1 hour minimum. Currency 1 hour/month (any tailwheel) or CFI checkout. Preheat the plane when the temperature is 40 degrees or below. Apply heat about an hour before your flight. Be sure the fuel valve in the plane is in the off position. 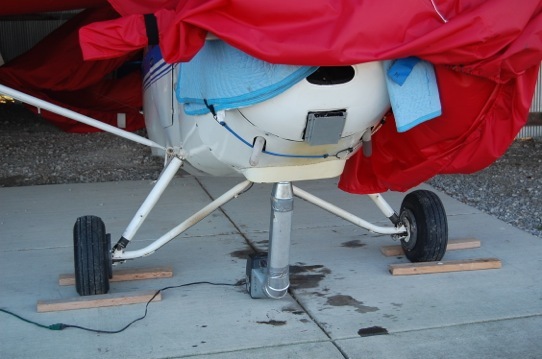 Place heater under cowling as shown. Cover cowling with blanket as shown. Use starting procedure outlined in the “Winter Ops / Preheating” article located on the web site under aircraft information.